Cycling, that’s the theme here. I was riding my bike down Water Avenue, holding my phone. If I had been driving, using a phone to shoot pictures would have been illegal. But I don’t believe the ban on holding digital communications devices while driving applies to people on bikes. If I’m wrong, I’m sure someone will let me know. This video lasts little more than a minute, but three cyclists figure in it: the guy holding the phone, and two others who probably were not riding for recreation. If there’s a point, it’s that riding a bike for transportation in Albany — for work, shopping or anything else– is not only possible, but maybe that it’s catching on. Even in dubious weather like Wednesday’s. Imagine the possibilities if biking caught on in a big way! We might no longer need to worry about traffic congestion or spend millions in a largely fruitless attempt to prevent it. 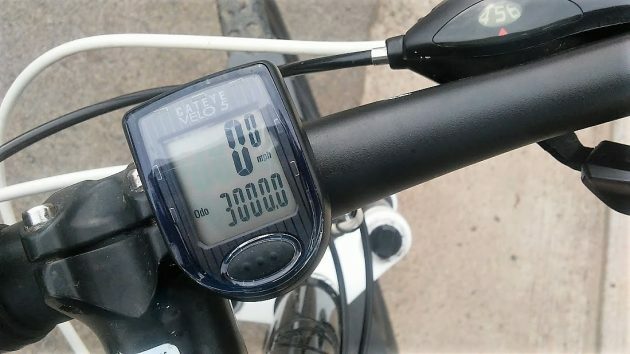 My bike computer, installed a year and a half ago, recorded a minor milestone Wednesday. I’ve been riding my bike in and around Albany for years now, mainly for fun but also as a way to see some of what’s going on. When you see something from a bike, it’s easy to stop to take a closer look, far easier than to stop the car, turn it around and look for a place to park. Also worth noting: Knife River has been working for a few weeks now on its Linn County contract to widen Riverside Drive from Albany to Meadow Road. 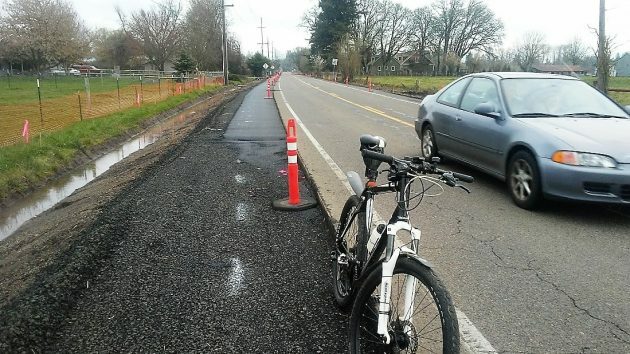 Wider shoulders to serve as bike lanes will be one huge benefit when the job is done in June. So riding a bike for transportation, already possible and reasonably safe on city streets, will be made a little safer on that road as well. Wider shoulders are beginning to emerge on Riverside Drive just outside of Albany. So do you brave the Willamette River bridges on your bike? I’ve never tried it on mine, the bridges are steep, roadway heavily traveled, and the “walkways” look treacherous., I’d probably walk my bike across on the walkways rather than try to ride. In truth, peering over the side of the bridge guardrails from on top of my bike would make me nervous. I also noted the roughness of Water Avenue, the “alligatoring” of the pavement, pot holes etc. You are a braver person than I, Hasso! Biking is a good thing….. now sweep the streets. Start with the bike lanes to all the schools. YES!!! And imagine all the many possibilities of health, happiness, self-reliance, and mastery. Car-dependence has made us and our children fat, lazy, unhealthy, frustrated (congestion), and depressed. It has made our built environment ugly and wasteful. Its monetary costs are enormous – often hidden in plain sight – look at any urban aerial photo to see how much of that valuable real estate is devoted to moving and storing cars (Corvallis is as bad as Albany), never mind the billions of dollars spent every year to build an extra lane or an extra mile. But help is on the way. Young people are less interested in driving and owning cars than they used to be. Some of their transportation needs will be met by car-sharing, Uber, Lyft, etc, and that’s a good thing because it shifts much of the cost from fixed to incremental. That, in turn, will encourage lower-priced ways of getting around like bikes and buses. When biking (and other alternatives) catch on in a big way, we’ll find the political will to spend more on bike paths, less on futile road widening, and to stop forcing privately-owned businesses and apartments to waste as much on parking space. Less rain tax. And that will get even more people onto bikes. Things are looking up! Get a go pro Hasso.